Disneyland, where dreams come true and magical experiences are made every day. Walt Disney’s dream park was realized almost 60 years ago and continues to exceed the expectations of guests year after year. Disneyland is eight pie wedged areas: Main Street U.S.A, Adventureland, New Orleans Square, Critter Country, Frontierland, Fantasyland, Mickey’s Toon Town, and Tomorrowland and at the hub is the pinnacle, Sleeping Beauties Castle. Given the shear size, length of service, number of guests and staff, it isn’t surprising that people have expired at Disneyland. People die everywhere. A growing number of urban legends have sprung forth regarding ghosts and haunts, as such, we at San Diego Haunted feel compelled to look into the darker side of Disney and see what we can find. A majority of our knowledge in this subject has come from online resources. We will try to post a complete bibliography, but a special thanks goes out to Kyris and Brian of http://www.hauntedhoneymoon.com. Truth: The apartment above the Fire Station on Main Street is on occasion used by visiting executives and Walt’s family. It has also been used to hold small private meetings. When the doors of the fire station are closed, Mrs. Disney (February 15, 1899 – December 16, 1997) was in the apartment above -The ringing of the fire bell by guests is disturbing. It is not widely known that there is a lamp in the window of the apartment above the Firehouse that is kept lighted at all times in memory of Walt Disney. Conclusion: It is possible that another cast member or visiting person could have gone unseen and turned the lights on or off without notice. 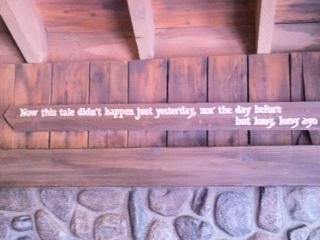 That being said, Walt loved Disneyland and it was the embodiment of a life long dream. I couldn’t think of a better soul to have watching over your day at the park. Rumor 2: Employees working on the “It’s a Small World” attraction report strange occurrences, such as the lights turning on and off by themselves, and dolls moving when the electricity is off. Supposedly, a person named Mary so loved the ride she never left even in death. Truth: Mary Blair was an American artist best known for the striking concept art that she produced for the Walt Disney Company. She contributed to the design of the “it’s a small world” attraction in many ways. Mary Blair died of a cerebral hemorrhage on July 26, 1978 many years after her work on Small World. Disney’s technology is not infallible; the oil-filled cylinders making up Audio Animatronics characters do occasionally drip or leak. Conclusion: There is no logical reason to suggest Mary’s spirit still resides at Disneyland, also nothing exists to suggest the area is currently active or haunted other than some noted possible equipment issues. Rumor 3: Pirates of the Caribbean, Haunted Mansion and It’s a Small World are haunted by a young child, usually spotted by the operator sitting alone when the park – ride is not open to the pubic. A child who loved the ride died young. His mother wanted to scatter his ashes at the ride site, but Disneyland refused. She decided to sneak in and scatter the ashes on the ride despite their refusal. Truth: In his 1994 book “Mouse Tales,” former Disney employee David Koenig relates the story of a tourist group that requested a quick memorial for a seven year old boy at the Haunted Mansion. Supposedly, Disney gave the family permission, but it turns out, the memorial was only part of the agenda that day. The mourners were viewed sprinkling a powdery substance off their cars subsequently the Haunted Mansion was quickly shut down. around after the island is to be closed. The employees glimpse the children running, but when they look for them, they are never found. Truth: Two persons have drowned trying to cross Rivers of America. 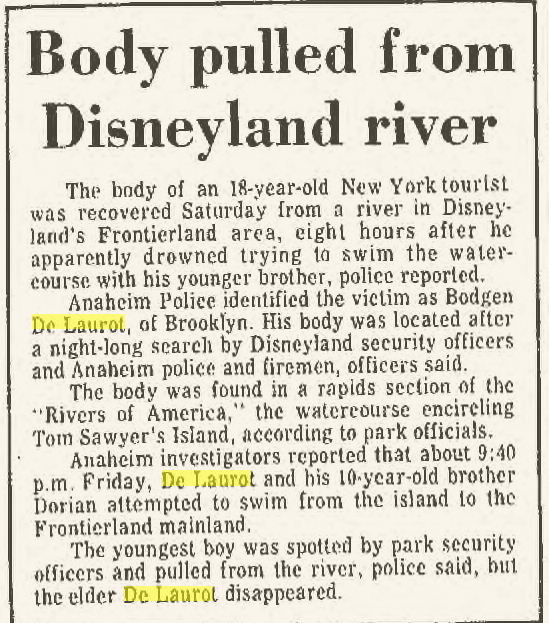 Bogden De Laurot (d.06/22/1973) age 18 and his 10 year old brother Dorian De Laurot, were stuck on Tom Sawyers Island after closing, rather than seeking help, they attempted to swim across. Dorian did not know how to swim, Delaurot tried to carry him on his back as he swam to shore. Bogden Delaurot went down about halfway across the river. The younger boy remained afloat by dog paddling until a ride operator hauled him aboard a boat, but Bogden was nowhere to be found. His body was not located by searchers until the next morning. Philip Straughan (d.06/04/1983) on his 18th Birthday celebrated Grad night far from his home in New Mexico, According to sources he was heavily intoxicated. The youth drowned after he and a friend took a maintenance boat at, The Rivers of America attraction. An area of the park that was closed off that night. Conclusion: Dan Scott- We have what looks like that basic items for any haunt- Water, struggle, high emotion, and untimely death, unfortunately they don’t always converge into a haunting. We need witnesses to come forward, and tell us what, if anything they have seen. I believe a real paranormal investigation is warranted if nothing more than to prove it isn’t haunted. Rumor 5: The Matterhorn side B (The side on the right as you are looking at it from loading station) is said to be haunted by the ghost of “Dolly.” Dolly was a mother who went on the ride with her children and died. Truth: Ask any operator of the Matterhorn about Dolly’s dip (we did 7/2/2014) , and you will get the condensed story. Dolly Regene Young (d.01/03/1984) started her ride on the Matterhorn fully seat belted, at some point before reaching what is now referred to as Dolly’s dip, she unfastened her seat-belt, as was thrown from her bobsled and run over, pinned-crushed by another passing sled. Conflicting news reports place Dolly possibly in the sled by herself. Conclusion: The cast members we talked with on July 2, 2014 said they have never seen any ghosts or had any paranormal activities while “walking the tracks” and cleaning up. Rumor 6: According to online claims, a ghost of a man has been witnessed on a bench along the path of Big Thunder Mountain Railroad. The claim states that Disneyland cast members choose to avoid the area at night. Truth: Marcelo Torres of Gardena, California (d. 09/05/2003) was killed and several guests injured when the locomotive engine separated from it’s train. Torres bled to death after suffering blunt force trauma to his chest. Conclusion: I asked multiple cast members about ghost sightings in the park, I was referred to the “trains”. The cryptic response seemed like some cast wanted to talk but were afraid or perhaps they were simply suggesting the ghost story which is part of the ride itself. In any case, I think some follow up is warranted, even if just to disprove the claims. These are not the last ghost stories and urban legends sure to come from Disneyland, tragic and untimely deaths have a way of producing many urban legends. We at San Diego Haunted only looked at a handful of the most common reported legends. To date only 10 deaths have occurred on the Disneyland lot. If you look at the numbers of estimated visitors, around 800 million that equals .00000125 percent of deaths vs attendees this is incredible numbers a tribute to the security and safety of Disney staff. 3 Responses to "Disneyland Paranormal Ghost Haunt"